The Scouting year is about to begin again, and this year after 5 years in Scouts (ages 11 to 14) I'm going back to Cubs (ages 8 to 10). My second oldest is continuing on to Venturers (ages 14 to 18) but said he only wants to continue on if I'm not there. Which is totally cool by me - in fact pretty awesome honestly. At the beginning of every Scouting year I always have a meeting with the parents during which I tell them amongst many other things : "the most precious thing I can give to your child is something I cannot give to my own - independence". As Scout leaders we try to mitigate against this with various techniques - like when climbing mountains in the Adirondacks we try to ensure we are not in the same hiking group as our own kids. Or for example in the spring on our first canoe trip this past year we were spread across 3 different camp sites on the lake, one of which was a bit further away - and my son was staying on it with two of the outer Scout leaders while I stayed on the other two sites. Anyway, my next son is moving up from Beavers to Cubs this year, and I'm joining him. In fact I'm moving into the Akela role - the head Cub leader - even though the program has changed completely in the 5 years since I was Akela last time and I'm walking into something completely new. This is the new "Canadian Path" in Scouts Canada, for anyone familiar with it. As much as I am a bit disappointed that I won't get to do some of the more exciting things that I really enjoy like Winter Camp in the backwoods, Canoe Trips, Hiking trips and so on, I am really excited about giving my next son the same sort of experience I helped give the older two when we went through the program together. And I'm hoping we get to spend the next 6-7 years together just like I did with the older two. But that's not what I'm here to write about. A little over 6 years ago I got into a canoe for the first time in my life as part of the Scouting program that my kids were and still are involved in, and I almost immediately got hooked. Not just hooked, obsessed. And even though I've been on lots of canoe trips since then even some outside of Scouting involving my 3 boys, and different friends and their boys - until last weekend we still had not done a family canoe trip. 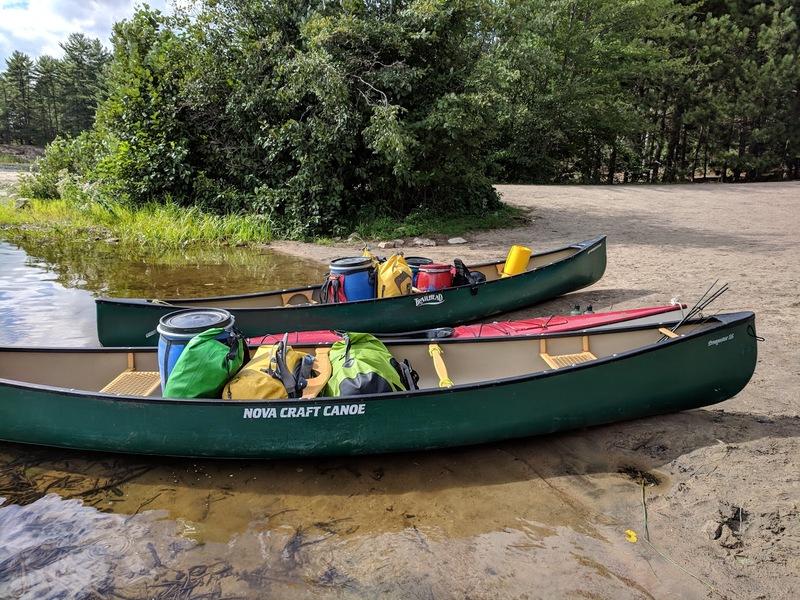 My 8 year old had been on 4 father-and-son canoe trips starting at age 4, but my wife had not been on one since she was a teenager a couple of decades ago. This year my wife and I finally agreed that we can and should do a trip - so a few months ago we booked a site on Stratton Lake in Algonquin Park, and we started planning. We chose Stratton Lake mainly because it is the access to High Falls, which is a popular swimming location because the waterfall is a natural waterslide. Also because the access point is Achray campground, a spot we've been camping at for a number of years now. Last year during our camping trip to Achray we took 2 canoes and paddled the family across Grand Lake up to the portage into Stratton, so this year we knew we'd be in good shape for a full-fledged trip. The main complicating factor for us was figuring out what combination of canoes would work - with a family of 7 including kids aged 1, 3, 8, 14 and 16, things can get a bit complicated. What we ended up with is 2 x 16 foot Prospectors (of course!) along with the new-to-us 16 foot touring kayak I picked up last fall but had not yet had on the water. It worked well with one of the teenagers in the kayak, my wife in one of the canoes with the other teenager and the 1 year old, and me paddling the other canoe with the 3 and 8 year olds on the front seat. I borrowed the Scouts canoe trailer and loaded the 2 canoes there, and had the kayak on the roof of my Suburban along with a cargo bin. Last fall when I was making my regular rounds of kijiji a nice looking kayak came up at what seemed to me to be a pretty reasonable price. 16 foot Swift in fiberglass - older but still in great shape. I don't know the kayak market like I do the canoe market, and I don't think I'd even been in a kayak before except maybe once, but I did know that much like canoes plastic was cheaper and heavier, fiberglass lighter and more expensive, and kevlar lighter and more expensive even still. So when I saw a 16 foot Swift Caspian Sea for $750 I wanted to go see it. But it came up at a time when I was extremely busy with vacation and then Scouts, and as such I really could not take the time to go see it. So after exchanging a few emails weeks passed - 5 or 6 weeks to be exact - and by then of course I figured the guy had long-since sold it. Then one day out of the blue I get another message from him - was I still interested for 500 bucks! Well I was still interested at 750 so sure I'd take it for 500 - I went right over to check it out, and took home my first kayak.